Growth Farms is focused on delivering investor returns by acquiring, managing and divesting high quality, diverse agricultural assets across Australia. The business is a privately owned investment management company which has achieved a long term net return of 10.4% pa to investors. 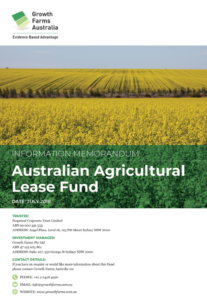 It was founded in 1999 by a small group of successful Australian farmers and has since grown to manage over A$400 million of agricultural investments for a global network of high net worth individuals, family office and institutional clients. Growth Farms’ core philosophy is to manage sustainable, efficient and profitable agriculture operations.